This is a wedding that all the guests will remember forever. For the groom’s surprise for his soon-to-be wife completely turned their lives upside down. Up until now, life has not been kind to this man. 13 years ago, he broke his leg. But, what normally is an uncomplicated healing process changed Kevin Taylor’s life forever..
Kevin developed a nerve disorder called RSD (Reflex Sympathetic Dystrophy). His doctor called it the worst case of the disorder he had seen! In 2009 he then experienced a fateful setback: the affected leg had to be amputated! The brave man tried to deal with the situation in his own way. And to not think about his own, terrible fate, to tell himself that it could have been even worse. His friends think highly of him and his strength: “The most remarkable thing about Kevin is that he never complained, despite what happened to him.” But the young bachelor’s life was about to change forever. It was love at first sight when he met his future wife. The wheelchair? It doesn’t make a difference to the Texan woman! One of Kevin’s friends recounts: “I came in, he turned around and was just grinning form ear to ear. There was a connection immediately.” The two decided to marry and began planning the day immediately, inviting their friends and family. But Kevin Taylor planned behind his future wife’s back a first class surprise. The guests have all arrived and the bride enters the room, accompanied by her father. The priest speaks the words to those present: “Please stand.” And that is exactly what Kevin Taylor does! Tears roll down his soon-to-be wife’s cheeks and she is completely perplexed. Too stunned to speak a single world. She sees her soul mate standing for the first time ever. Kevin Taylor worked for this moment for weeks and months. He began physiotherapy secretly behind his girlfriend’s back, training for countless hours, until the seemingly impossible came true. 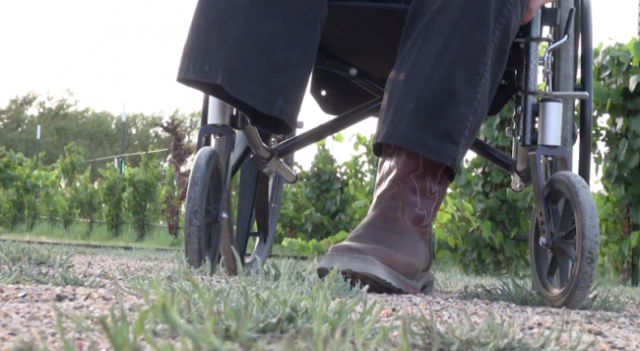 He learned to walk with his prosthetic, despite the indescribable pain caused by his illness. He managed to strengthen once atrophied muscles in his leg. Until the point where he was able to stand and look at his future wife in the eyes on their wedding day. 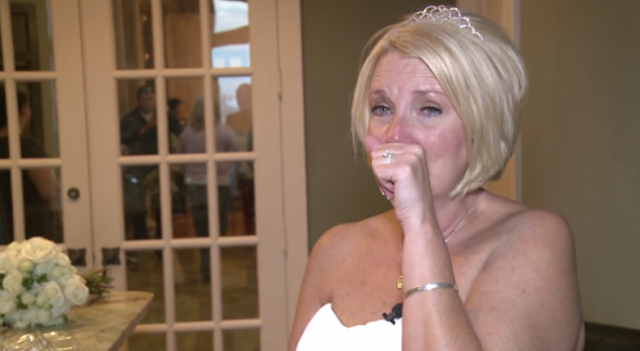 It’s almost impossible to imagine how this woman must have felt on her wedding day.